Please note: The pressure ratings given are based on an operating temperature of 20°C. 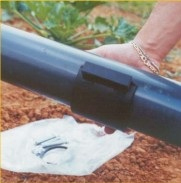 If the temperature is increased, the pressure rating will be reduced. 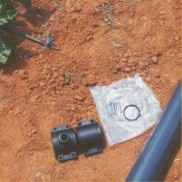 After locating the area of pipe where you wish to use the fitting, prepare the clamp saddle, the bolts and the O-ring. Position the lower part of the saddle in the exact position you want it. After inserting the O-ring in its proper seat, position the upper part of the saddle and start screwing the bolts in. Screw the bolts in with the correct tools to make sure the saddle is tight to the pipe. 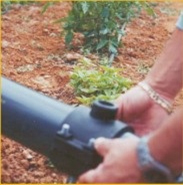 Once secure, drill the pipe perpendicularly within the outlet space. 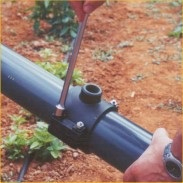 Once the hole is complete, the threaded part is ready to be connected. 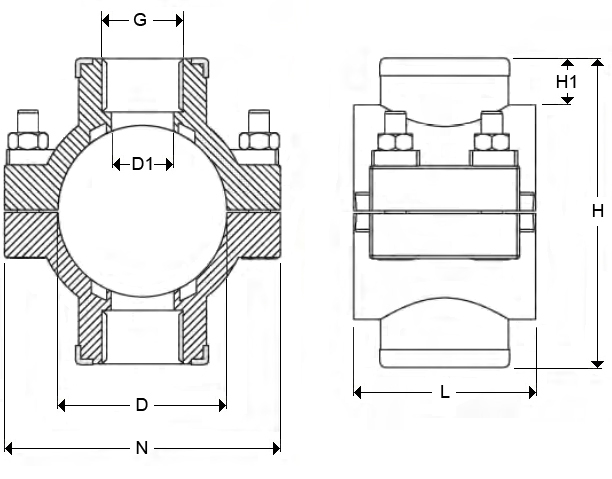 These double outlet clamp saddles are used to branch off existing pipework in two opposite directions, and can also be used to join different pipe equipment into the system. 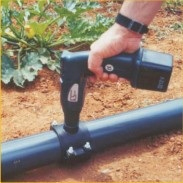 The double outlet feature means that as well as allowing branching off from an existing pipeline, the clamp saddle also gives two points of exit for the flow which can be directed either into other lengths of pipe or through auxiliary pipe equipment such as pressure gauges or water meters. Double Clamp Saddle Reinforced 25mm x 1/2"
Double Clamp Saddle Reinforced 25mm x 3/4"
Double Clamp Saddle Reinforced 32mm x 1/2"
Double Clamp Saddle Reinforced 32mm x 3/4"
Double Clamp Saddle Reinforced 40mm x 1/2"
Double Clamp Saddle Reinforced 40mm x 3/4"
Double Clamp Saddle Reinforced 50mm x 1/2"
Double Clamp Saddle Reinforced 50mm x 3/4"
Double Clamp Saddle Reinforced 50mm x 1"
Double Clamp Saddle Reinforced 63mm x 1/2"
Double Clamp Saddle Reinforced 63mm x 3/4"
Double Clamp Saddle Reinforced 63mm x 1"
Double Clamp Saddle Reinforced 63mm x 1 1/4"
Double Clamp Saddle Reinforced 75mm x 1/2"
Double Clamp Saddle Reinforced 75mm x 3/4"
Double Clamp Saddle Reinforced 75mm x 1"
Double Clamp Saddle Reinforced 75mm x 1 1/4"
Double Clamp Saddle Reinforced 75mm x 1 1/2"
Double Clamp Saddle Reinforced 90mm x 1/2"
Double Clamp Saddle Reinforced 90mm x 3/4"
Double Clamp Saddle Reinforced 90mm x 1"
Double Clamp Saddle Reinforced 90mm x 1 1/4"
Double Clamp Saddle Reinforced 90mm x 1 1/2"
Double Clamp Saddle Reinforced 90mm x 2"
Double Clamp Saddle Reinforced 110mm x 1/2"
Double Clamp Saddle Reinforced 110mm x 3/4"
Double Clamp Saddle Reinforced 110mm x 1"
Double Clamp Saddle Reinforced 110mm x 1 1/4"
Double Clamp Saddle Reinforced 110mm x 1 1/2"
Double Clamp Saddle Reinforced 110mm x 2"